This 2.5mm (.098") pitch connector is used to interconnect printed circuit boards. It easily resists distortion during mating, thus ensuring reliable contact, even under adverse conditions. High contact pressure. Fully shrouded header. The header is interchangeable with those of crimp style XH connector and insulation displacement NR/NRD connectors. This vibration-resistant, double-beam contact provides high contact pressure and thus eliminates contact bounce during vibration or shock. The four-sided shrouded header prevents the socket housing from being misinserted or distorted during mating. The slots in the header's shroud fit snugly into the receptacle housing, guaranteeing a vibration-proof coupling. And the serrated square posts are pressure-fit to prevent flux from entering during soldering. 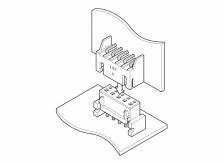 The solder tails of both the plug and receptacle have board retention features. This ensures secure mounting and accurate location during soldering. Both top-entry and side-entry receptacles and shrouded headers are available, thus allowing printed circuit boards to be connected vertically, horizontally or parallel to the mother board. 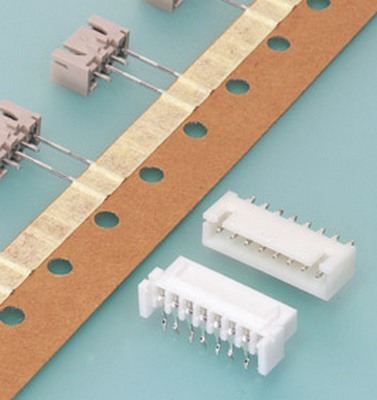 The shrouded header is interchangeable with the XH wire-to-board crimp style connectors, the NR and NRD wire-to-board insulation displacement connectors.